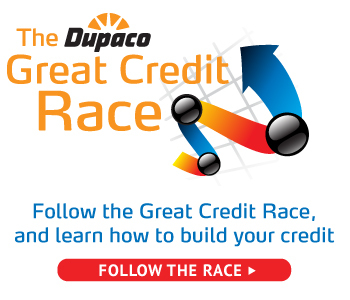 With Dupaco’s Great Credit Race at the halfway mark, it’s proving to be a close battle. Too close, if you ask some. Two of the dozen racers—Anna O. and Kiernan S.—are tied for first place, both reporting credit scores of 701. The race leaders were stunned to learn about their top rankings. Not daring to mess with success, both plan to continue following their race strategies until the very end. Beginning May 1, participants began racing to build their credit score from 0 to as high as possible in six months. Each racer received a Dupaco Visa credit card with a $1,000 limit and one-on-one credit and budget coaching. The participant with the highest score at the finish line will win $1,000. The race leaders say the secret to their success has been using their credit cards for occasional small purchases, paying them off immediately each time. Whatever happens at the finish line, both racers say they will walk away understanding a lot more about building their credit as they begin the next chapters of their lives—college. “Thank you to everyone at Dupaco for offering this and helping me understand a credit score,” Kiernan says.